There wasn't much other than reading this past week. I was reassured when I got the paperwork about my Teacher Retirement Association pension and my new Medicare and supplemental insurance papers. I hadn't heard anything since I filled out the applications earlier this year and was starting to get a little worried. My official Medicare card arrived this week and my first TRA pension check was deposited in my bank account. I also got the cards for my new supplemental insurance. The only thing I need is my new contract at school. However, this is a negotiations year in Minnesota. I probably won't see my new contract until after we settle. My brother and I did go out on his day off this week to try to find the restaurant that is supposed to have "the best burgers in Duluth." After a couple of Google searches, one to find the name of the restaurant and the second to find driving directions to it, we went out to lunch at the Breeze Inn. The burgers were really good. I had a Lucy Melt with Swiss cheese inside and out of my burger which was served on grilled marble rye bread. My brother had a Sweet Chili Bacon Cheeseburger. We both had the sweet potato fries. All of it was very good and we wouldn't hesitate to go there again. It is hard to believe that June is over already. I had an excellent reading month. I finished 40 books in June. Twenty were from my TBR mountain and the other 20 were review books. Nineteen were YA books and the rest from my adult section. Eleven of the books fit into the Mystery/Thriller genre and another 12 were Fantasy. I didn't have any books that I abandoned unfinished this month. I have reviews and other associated posts scheduled through August 13 for both blogs with a couple of reviews that will show up later than that also scheduled. The first two books I read this week were sequels. Public Enemies by Ann Aguirre was from my review stack. This is a contemporary fantasy about a girl who gets caught up in a war between the gods. I enjoyed this sequel and will be looking forward to the third book. My review will be posted on August 1. 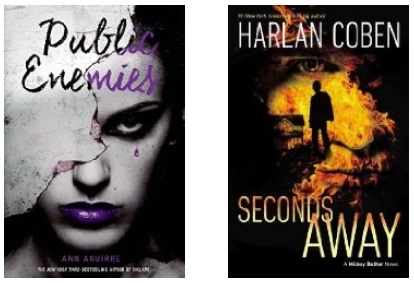 Seconds Away by Harlan Coben is the second book in the Mickey Bolitar mystery series. I've had it on the TBR stack since I read the first book in the series in 2013. This was also a good story. In fact, I enjoyed it so much that I bought a copy of the third book in the series which doesn't help me meet my goal of actually lowering the height of TBR mountain this summer. But I need to know how the story finishes! My review will be posted on August 5. I enjoyed Mechanica by Betsy Cornwell. 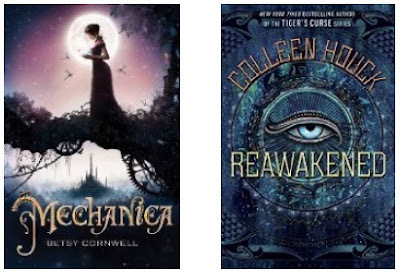 This YA fantasy based on the Cinderella story had some steampunk aspects. Mechanica prides herself on being an inventor. It also had magic and a handsome prince. But this Cinderella isn't looking for the kind of "happily ever after" that needs a prince. She has her own plans. My review will be posted on August 6. I also read Reawakened by Colleen Houck. This one is a contemporary fantasy wherein a young woman discovers a reincarnated mummy at the Metropolitan Museum of Art and decides to help him 1) return to Egypt to find the canopic jars that hold his powers, 2) reincarnate his two brothers, and 3) defeat the god Seth who wants to destroy Earth. I thought this story was quite melodramatic and filled with more detail about Egyptian mythology than I wanted to know. My review will be posted on August 8. 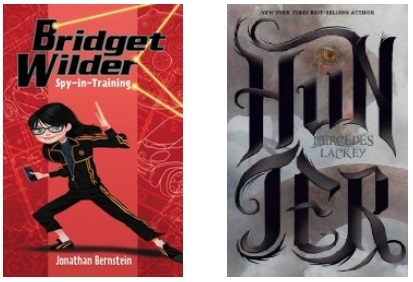 After finishing the last of my August release review books, I went back to TBR mountain. Fairest by Marissa Meyer tells a side story in the Lunar Chronicles. In this story we see how the evil Queen Levana become the character we love to hate in that series. My review will be posted on August 13. 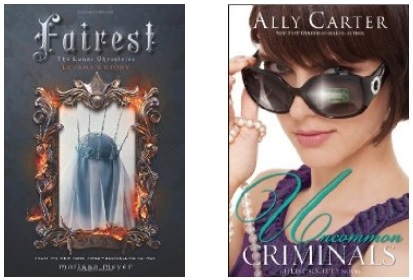 Uncommon Criminals by Ally Carter has been on my TBR mountain since October of 2014. I'd read all the Gallagher Girls books and want to read the Heist Society books too. This one was a fun caper mystery. My review will be posted on August 12. 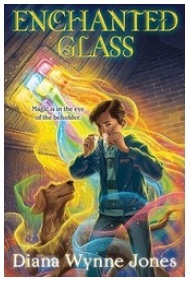 I dug deep down in TBR mountain to find Enchanted Glass by Diana Wynne Jones. I got it on April 7, 2010. This is a middle grade fantasy. 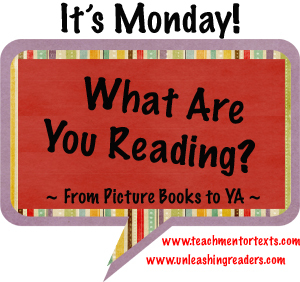 I have two more books from my TBR mountain for next week. 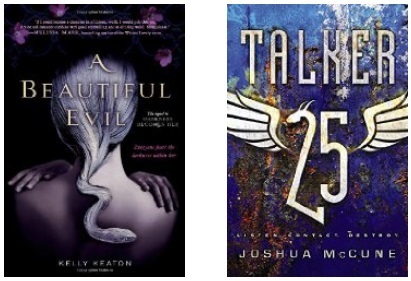 A Beautiful Evil by Kelly Keaton has been on the pile since February 21, 2012. I think the snake on the cover has put me off choosing this urban fantasy. Talker 25 by Joshua McCune hasn't been on the pile long. I got it this past June. I was intrigued when I was told that there were dragons in the story. After I finish those two, it is time to start reading the huge pile of review books that will be released in September. Bridget Wilder: Spy-in-Training by Jonathan Bernstein is a middle grade mystery that will be released on September 1. Hunter by Mercedes Lackey will also be released on September 1. This is a fantasy. My copy of Found by Harlan Coben arrived and now I can finish the Mickey Bolitar series. 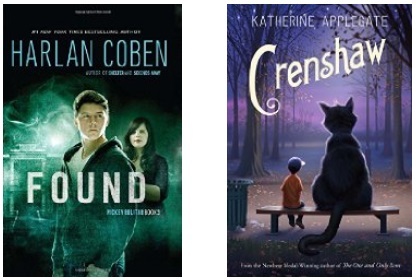 I succumbed to ARC envy this week and added Crenshaw by Katherine Applegate to my review stack. I had been seeing so many good things about it in my Twitter feed that I just couldn't resist. Now the tally of September releases on my review stack has reached 18. I added the two SYNC audiobooks this week too. These are both new to me. You can download your free copies until July 9. I am really curious about Mechanica. I want to give that one a try because I love fairy tales retold. I love the Lunar Chronicles series though I wasn't a fan of Levana or Fairest. It was interesting to see how Levana became the way she is but she and the Lunar Court are really messed up. Makes me wonder how Cinder will manage if she becomes queen of Luna (part of me thinks Winter will end up ruling instead). I liked Bridget Wilder. "Melodramatic" is a good description of Awakened! Looks like you never have to worry about running out of things to read! I love Heist Society! And Gallagher Girls. Was actually not the hugest fan of the new Embassy Row but will give it time. Bridget Wilder looks like fun! Will have to add it to my TBR list. Hi Kay, I've got the first couple in The Lunar Chronicles in my pile of books to read this summer. I generally like these adapted fairytales, so Mechanica looks interesting too. OOh nice! I can't wait to read Public Enemies and Reawakened! Love those authors! Fairest was delightful too! And A Beautiful Evil was good too! I can't remember when I read that one, but I still need to read the latest in what I thought was a trilogy! I think Kelly self pubbed that one. Forgetting the title at the moment too! Too much book inventory and stats in my head to remember all of them! LOL! I have never read any of the Lunar Chronicles & even won the first one a long time ago, but sent it on to our library. I would love to catch up, & read Fairest too, but it's not likely soon. Enjoy your July reading too! Mechanga sounds interesting tio me. I'll add it to my summer reading list! Crenshaw has been in my sights for a while, must get it! Enchanted Glass looks like an interesting one too.